The human brain is a mystery – but not anymore. When scientific progress enables the deliberate deletion and modification of memories, Dollhouses are built – world-wide underground institutions that program people to not only think, but become whoever they need to be. 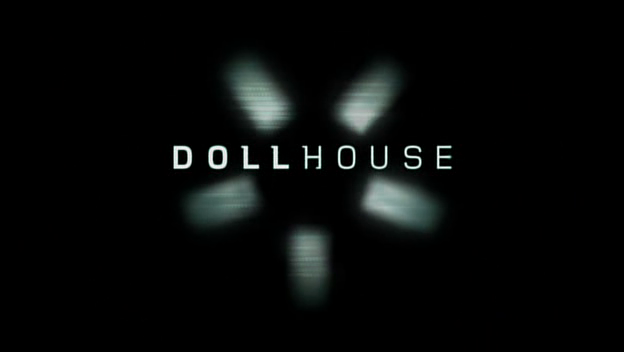 The TV series Dollhouse ran with two seasons from 2009 to 2010, yet another brainchild of the master Joss Whedon – also responsible for the amazing things called Firefly, Buffy the Vampire Slayer, the current Agents of S.H.I.E.L.D. and more. To me even the best of his works, Dollhouse does not disappoint on any level (except for length, naturally); it is a gut-wrenching experience that you will not forget easily. Dealing with philosophical issues like morality, control, free will and human nature, the series largely focuses on a ‘doll’ called Echo (Eliza Dushku), one of the most favourite and most frequently contracted dolls, although it later extends its focus to the others as well. We are forced to watch as people pay incredible amounts of money to get exactly who – not what – they want for a short period of time – encounters may be sexual, emotional, business, anything you can think of. Once programmer Topher Brink (Fran Kranz) imprints you with a persona, that is who you are – no questions asked. Be it to love someone unconditionally or to be perfect at a certain job, dolls will not diverge from their set path. Sounds wonderful – or not? No other series that I know of has attempted – and mastered – such versatile acting even in just one actor. The point of Dollhouse is that people can be anyone if programmed that way, and you watch on screen as they transform from an empty child-like shell without actual memories to real human beings, complete with history and skill. A demanding job for any actor, and although the personas generally stay within a certain area – Echo is often contracted as a happy-go-lucky persona, but she can also show quite different sides –, it is amazing how much detail, effort and versatility is put into those characters. All actors are doing a great job at it, and especially the performances of Eliza Dushku, Alan Tudyk and Dichen Lachman will simply drop your jaw. Mercilessly throwing you into the story in medias res, Dollhouse creates one of the scariest scenarios out there and fully exhausts the endless possibilities it has. Not only is it disturbing getting to know the dolls as ‘empty shells,’ it is even more disturbing to see what kind of engagements they are booked for – and while we’re at it, it can be even more disturbing to see what kind of major hiccup in life was necessary for them to willingly succumb to such a state (alas, only for five years, and those will be gone in the blink of an eye – literally). Opinions – also public opinions – vary when it comes to the purpose and means of the mysterious Dollhouses, and the characters involved in the operation are morally corrupt in many ways. Indeed, they need to be if they are able to see the operation as a ‘good service,’ or at least not question it too much. They’re all there for their own gain – money, power, science. Whether it’s the ruthless head of the Dollhouse Adelle DeWitt (Olivia Williams), the somewhat more sympathetic chief of security Boyd Langton (Harry Lennix), the dorky-adorable Topher who supposedly lacks any morals at all, or even the righteous ‘knight in shining armour’ FBI agent Paul Ballard (Tahmoh Penikett), you’ll equally love and hate all of them throughout the series, sometimes even both in one episode. And while it’s fairly easy to simply hate (mostly) everyone in the first season, the second season is much more difficult on that level, and their acts are peeled off, layer by layer, to their very core. In the end, you don’t even know who to love and who to hate anymore. One of the fascinating and frustrating things about Dollhouse is that the subject matter provides more than enough material for shocking scenarios. Pretty much every episode feels like (at least) one punch in the face, every single time. And just when you think you’ve had it all figured out, Whedon pulls yet another intricate sub-plot out of his sleeve, full with its own shocking moments. What about that ‘accident’ called Alpha that everyone refers to? You can’t even imagine. What about the attic everyone is threatened with? You have no idea. Watching the series is not an easy feat – it’s emotionally demanding and it takes its toll. While that would be a reason not to be able to stomach many episodes at once, it is at the same time brilliant enough that you’ll willingly go through that emotional wreckage just to see what’s happening next. Length does matter – doesn’t it? Dollhouse is definitely a recommendation, and I’m sure I’ll be watching it many more times. The only bad thing about this series is that it is too short – the second season in particular feels a little rushed, trying to accomplish everything that still needs to be accomplished to come to a satisfying (or not?) conclusion. It easily had material for yet another season, but not more than that without ruining everything, I suppose. Interestingly, the season finales are set ten years in the future, giving you the choice to either watch everything chronologically and add the season finales as a double episode at the very end (as I did), or watch it as intended, and wonder for one whole season how the heck it could have come to that; there are perks to both ways. But no matter how you watch it, you definitely should watch it. And as you do, just remember that things could – and will – be worse than they are. Because where you have that kind of power, what could possibly go wrong?